Make-do Mum: Pink flower sushi for six year olds. Isn't this pretty? Well, pretty to a six year old at least. My oldest loves eating sushi, and her favourite is salmon nigiri. But making fresh salmon nigiri everyday for her lunch is unlikely to happen, mainly because no one else wants to eat quite as much salmon as she does. This sushi flower though has ingredients that we do generally have: ham and egg. I had colouring dramas. I wanted to use beetroot as my colouring agent but didn't want boiled beetroot flavoured rice. I was not getting a bright enough pink with the beetroot juice I'd made so added a small amount of ordinary red food colouring. No matter how much I mixed it I could not get uniform coloured rice. Next time I would add the colouring the sushi vinegar, or use more highly concentrated beetroot juice. The beetroot juice was at least evenly colouring the rice, just not deeply colouring it. Very coincidentally, a Japanese friend and his family popped over to visit while I was making these 'flowers.' I was worried about adding too much liquid to the finished rice as I didn't want it to be too gluggy. He said that it was typical to use a little less liquid when making Japanese rice for sushi to allow for the sushi vinegar that you put in at the end. I'll remember this tip for next time. (this recipe assumes that you know how to roll sushi - you should watch a tutorial on You tube if you are unsure). Mix up two eggs with a teaspoon of soy sauce and spread thinly over a frying pan. When cooked through, remove from heat and cool on a tablecloth. Take a sheet of nori and place on a sushi mat. Place the omelette in the centre. You can either cover the omelette with thin slices of ham (as I did) or tear ham into small pieces and place randomly over the omelette (this gives a slightly different effect when rolling). If you want to use pickled ginger as well as or in place of the omelette you can add it here. Tightly roll this mixture and place to one side. Add the sushi vinegar (with the food colouring) to prepared rice (look at the back of the sushi vinegar bottle to determine how much is needed for your amount of rice). Stir through thoroughly. Spread evenly over the sheet of nori. 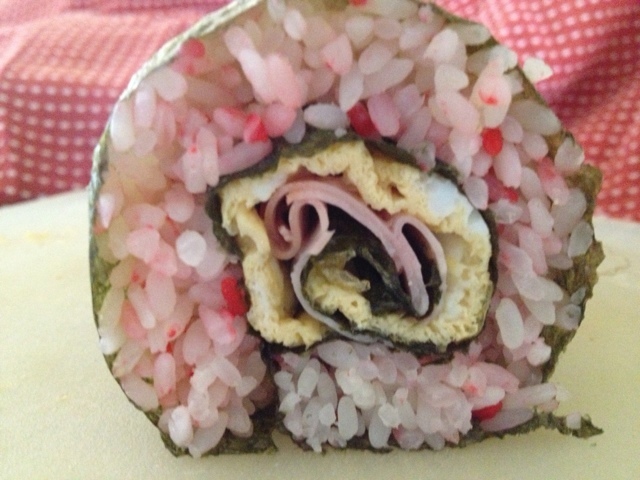 Place the egg and ham nori roll on top and roll together. Use a sharp knife to cut into slices. I think adding black sesame seeds to the pink rice would also look good, I might try this next time. I'd be tempted to try using baby spinach, and might in fact omit using a separate sheet of nori for the egg and ham in favour of baby spinach. Japanese food stores apparently have a fish based food colouring you can use as well. Awesome! I may try this with purple carrot pieces cooked in with the rice and then lifted out. Not sure about the separate wrapping for the egg. I might just roll it directly in with the rice. I did one without the extra nori in the middle - I think it gives the flower better definition. But if nori isn't your favourite part then you may wish to avoid it.